Number 17 is a one that symbolizes the power to go through obstacles, to vanquish foes and to win over the rebellious. God coped with the sins of rebellious people through the rainy water of flood which began on the 17th day of the 2nd month. Noah and others boarded on ark on the 17th day of 7th month. God’s son Jesus overcome the death when God took him back on the 17th day of a month. In the Corinthians book, the seventeenth word is love, which is the most precious gift that can ever be received by anyone. God’s love is endless, forgiving and eternal. Those who truly love and believe in God will be rewarded by the highest honor of coming back to life. 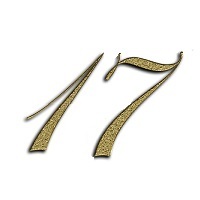 Number 17 symbolizes the unity with God, loyalty and ability to withstand the hard times or even losses, but then those people will be rewarded by the eternal life.